My niece seems to be going to a lot of weddings lately. She asked me to make her another wedding card. 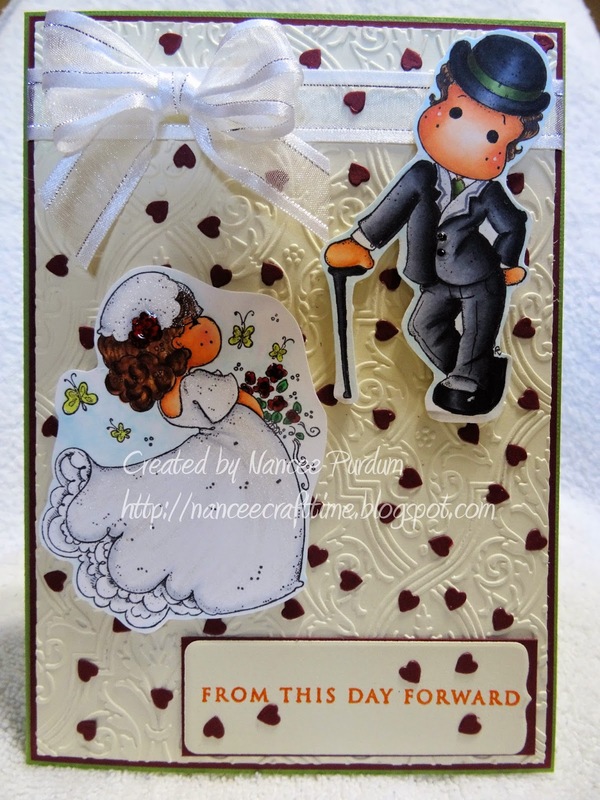 I decided to use two different Magnolia images, Wedding Tilda and Edwin with Derby Hat. I tried to use the colors of the wedding party to make it a one of a kind card for the bride and groom. 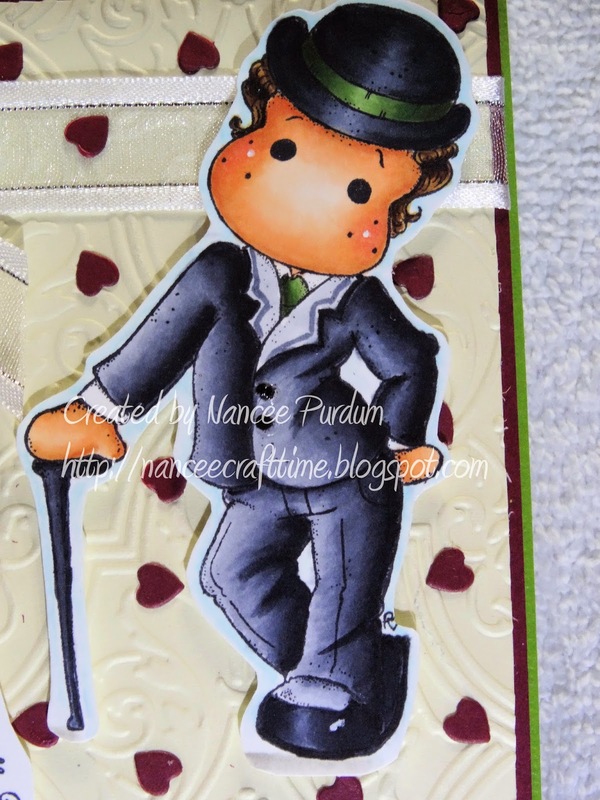 I used an Anna Griffin embossing folder, Pirouette to emboss the background. This is one of my favorite embossing folders for backgrounds. And another look. . . I colored the images with Copic markers and then added some sparkle to Tilda’s dress with my clear Wink of Stella brush. I also added some glossy accents to the flowers and Edwin’s buttons. When I put it together, I thought the background needed a little something else. I used the Memory Box Heart of Hearts die to cut out the little hearts and then sprinkled them on the background and glued them on. I thought it added just the right touch for this wedding card. A close up of Tilda and Edwin. . . I added some ribbon from my stash and a sentiment from Stampin Up to complete the front. 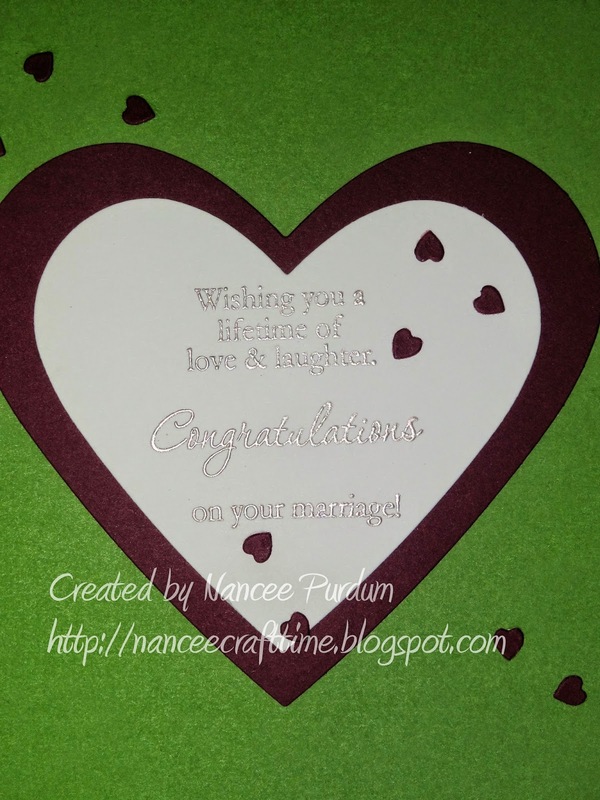 On the inside, I die cut two hearts and added three different sentiments from Stampin Up to create the wording. I sprinkled just a few of the remaining hearts I had on the inside to tie everything together. 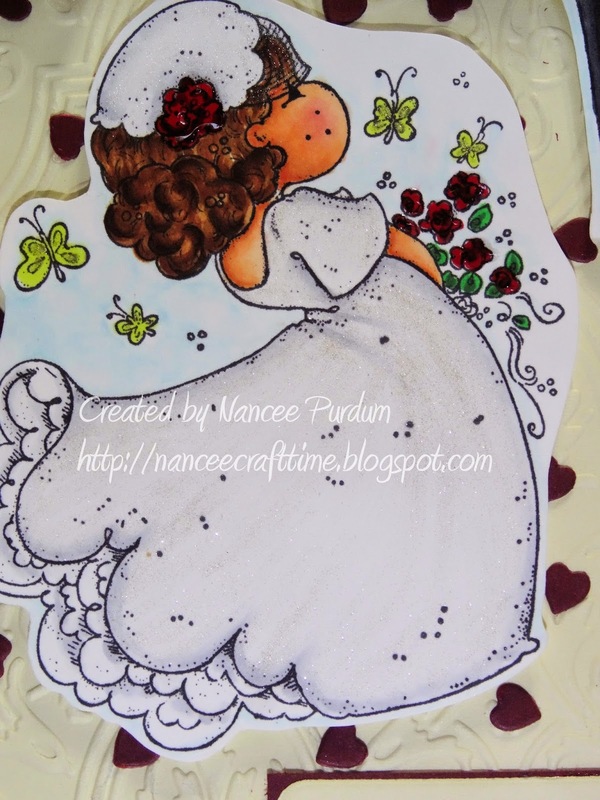 Gorgeous card Nancee! I love it! Hi Nancee, oh my! You did a beautiful job on this card. The embossed background is gorgeous and I love the sprinkled hearts outside and in. 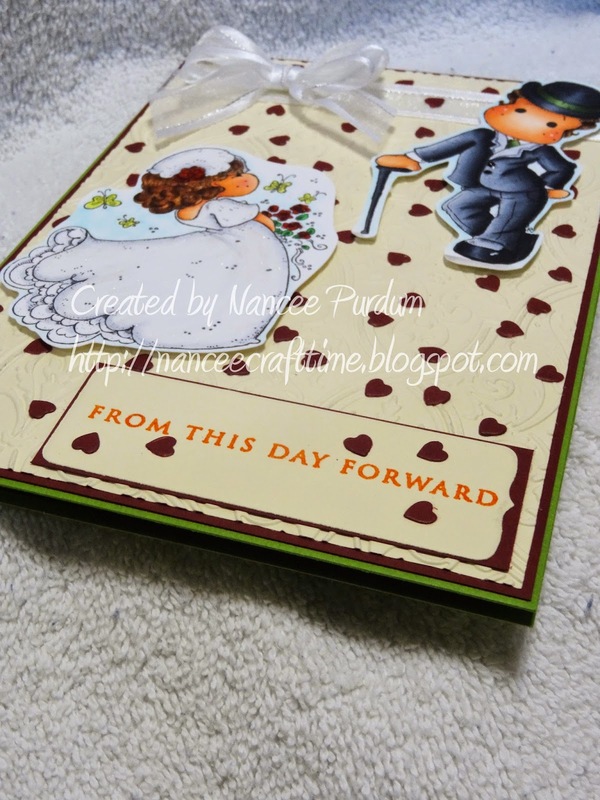 This handmade card will be such a treasure for the happy couple. Beautifully done Nancee!!! I'm sure your niece enjoys giving your special cards! Lovely card, Nancee. Gorgeous coloring, Hun. Love the embossing behind your Magnolias. What a beautiful card! Your colouring is out of this world!! Wow! 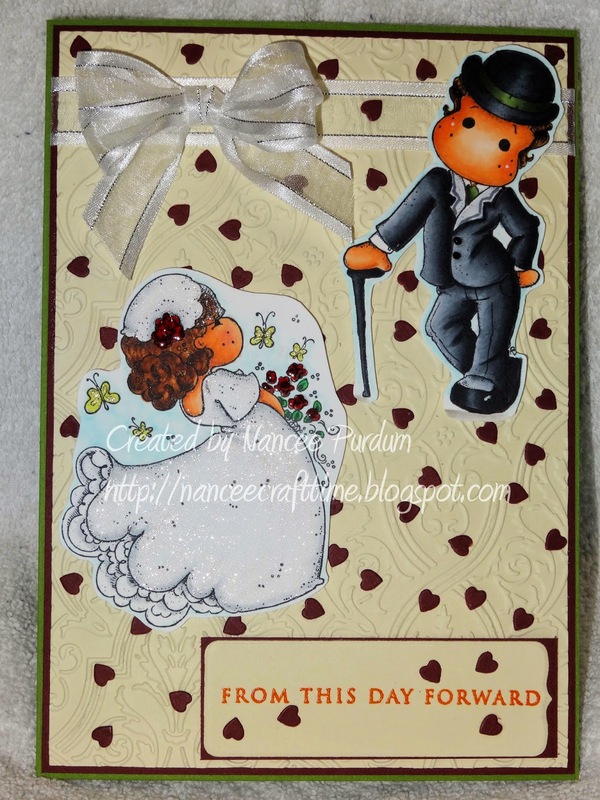 this is so very pretty Nancee, your colouring of this sweet couple is fabulous, love your embossing and all those pretty hearts. Gorgeous coloring of Tilda and Edwin. I love how all the hearts make this beautiful card come to life. What a sweet card! Beautifully done. ← Happy 79th Birthday Mom!